Captain D O Mulholland scores the first victory for 40th squadron over a Fokker which he sees attacking an FE2b. British troops defeat an enemy attack on the left bank of the Struma in Salonika. Lieutenant “The Honorable” Edward Wyndham Tennant (Grenadier Guards) is killed in action at age 19. He is the son of the 1st Baron Glenconner and one of the Great War Poets. He is a nephew of Mr Asquith and is at Winchester when war is declared and though he is only seventeen at the time, he joins the Grenadier Guards. His war poems include: Home Thoughts In Lavantie, the Mad Soldier, and Light after Darkness. Of orange sky-line ’neath a turquoise blaze. Second Lieutenant William Swain (Yorkshire Regiment) is killed at age 23. His brother died at home last July. 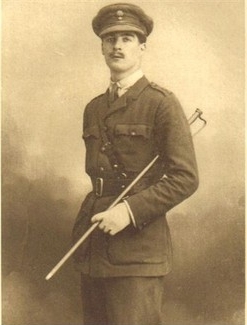 Second Lieutenant John Morton Mansel-Pleydell (Royal Field Artillery) dies of wounds at age 32. He is the twin son of Canon John Colvile Mansel-Pleydell his brother dying on service in the Royal Horse Artillery in India in 1910. Private William Claydon (Cambridgeshire Regiment) dies of wounds received in action at age 23. His brother will be killed in November 1917. Private Charles E Kennington (Western Ontario Regiment) is killed at age 35. He is the first of three brothers who are killed in the Great War.